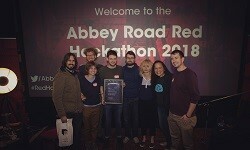 Congratulations to Ph.D. students, Alejandro Delgado Luezas and Tim Christian Kirby from the School of Electronic Engineering and Computer Science who, with four team members from Telecom ParisTech and INRIA Rennes, were recently awarded the top prize for ‘The best use of AI’ at Abbey Road’s inaugural Hackathon. Abbey Road's Hackathon aims to bring together our community of engineers, artists, producers and academics with the most innovative partners, inviting the pioneers of the future to explore some of the questions facing the creative industries. ‘You know you've just arrived at the most iconic music studio in the world when you notice a bunch of people doing silly stuff along a zebra crossing. Inside, though, the solemnity of the security guards reminds you where you are leaving your footprints. After a lovely walk through the corridors glancing at photographs around, we arrive at Studio 1. Twenty-four hours of coding ahead, eighty participants awaiting in the church-like space and there we were, four MIP-Frontiers fellows down for another hack. Kilian, Giorgia, Ondřej (Télécom) and Alejandro (Roli) found Tim Kirby (QMUL) and Diego Di Carlo (Univ Rennes) to serve a very cool idea: 'Rapple', an AI-powered opponent to challenge for a rap battle. The hacking was then inaugurated and no team lost a single second to get their hands dirty. In our case, the synergy was visible in the first moments and blinding by the time we finished the planning sketch. We were all so determined to create the rudest, wittiest, most destructive opponent one could ever encounter in a rap battle. Or, at least, a pretty amusing prototype. For that, we needed to get an appropriate chatbot code, speech-to-text and text-to-speech software and a beat alignment algorithm to make 'Rapple' deliver with flow. Time passed comfortably for us. We held brief group discussions every hour and even had some break time to drink a coffee or play music with other hackers. In the end, we were able to come up with a working prototype by 3 am and, from then on, everything got funny and experimental. “What if we get a vocoder for 'Rapple'?”, “Damn, this thing is way ruder than expected”, “Is there a sweet spot to get the heaviest punchlines?”… All in all, we spent the rest of the night perfecting our baby while getting random sleepy people around to play and have a laugh with it. Research Degrees at The School of Electronic Engineering and Computer Science. Ph.D. student experiences at The School of Electronic Engineering and Computer Science. Computer Science and Electronic Engineering degree programmes at The School of Electronic Engineering and Computer Science.